Kids become “rubbish warriors” in Garbage: Investigate What Happens When You Throw It Out. Encouraged to think about the choices they make that generate garbage in the first place, readers learn ways to reduce, reuse, recycle—and rethink their actions. Along the way, kids explore the science of garbology, discover fascinating information archaeologists learn by excavating middens, and use projects to investigate the world of trash. Activities include whipping up a delicious edible landfill, brewing natural dyes for a T-shirt, and comparing the effects of commercial and homemade cleaners. Kids will learn that the battle against the world’s overwhelming waste problem begins with them. I have been teaching my children about reducing waste since they were toddlers and I believe it is an important message to start at a young age….in fact we enjoy composting, recycling and re-using whenever possible. I was delighted to have the opportunity to read with them the new children’s book from Nomad Press, Garbage: Investigate What Happens When You Throw It Out by Donna Latham. This latest offering in the Build It Yourself Series includes 25 fun projects for kids. 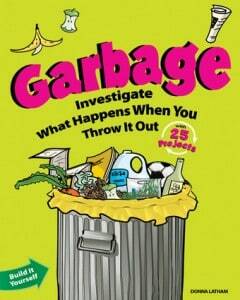 The book includes a wealth of information and facts about trash and how children can become “Rubbish Warriors”. Our favorite activity was making Recycled Rainbow Crayons where we took broken crayon stubs and then I melted it in cupcake liners in the oven and we let it cool to make really neat new crayons of multi-colors. I really appreciate that most of the activities requires only minimal adult supervision for older children and hands-on direction for younger children so it promotes independent thought and creativity. We really enjoy this informative yet fun book and it would be a great home school resource, science projects or for rainy day fun.